The last thing Niamh remembered was drowning, so it came as a surprise when she woke up. At first she thought she was dreaming. The air had that strange grey sense of a dream. Or being underwater. She held up her hand in front of her and moved it from side to side. Her skin was grey and lifeless, as if the water had seeped into her. David. She sat bolt upright, reality flooding back all at once. David’s pale face receding as the lifeboat carried him and his fiancé away from the sinking “Mistress”. “Mistress”. Her boat. There was no hope for it and no time for rescue. But she had stayed because she had to, because it was her boat and the captain goes down with the ship. Sighing, Niamh looked at her surroundings. She was in some kind of cabin all right, but she was not aboard the “Mistress”. The walls, floor and ceiling were cracked, green wood, scattered with jagged holes. Small fish darted in and out. The cabin door swung open and a young man wearing a uniform walked in. Niamh took a moment to consider what to say, a thousand and one questions all demanding attention. Niamh nodded, still thoroughly confused. She felt oddly calm. I’m dreaming, she thought, or I’m dead. Either way, things are different. As long as David is okay. The man gestured towards the open door. She followed the man out of the cabin. They moved through the ship, which was lit by lamps that emitted a cold green glow. 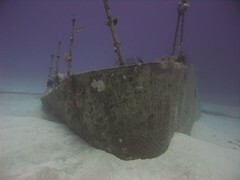 The hull was patched and worn, home to scuttling shrimp and encrusted with barnacles. Niamh looked more closely at the man in front of her. His uniform was old, from the Napoleonic Wars if her history was accurate. How long he had been here? Heaven, hell or limbo? They emerged onto the deck. The dark sea swirled around them. Far above, Niamh thought she could see moonlight tapping the surface of the water. Around her, men with silvery skins went about the business of manning the ship. The boat was moving. Niamh ran to the edge and looked down. Waves of sand rolled aside as they cruised across the ocean floor, disturbing stalk-eyed crabs and slicing through the seaweed. There was a shout from above. Boats and ships loomed from the deep, sailing across the sand beside them. Niamh stared. There were fishing boats with torn, flapping nets, giant, metal hulled warships, a number of battered and rusting submarines. ‘Why are they all here?’ asked Niamh. ‘For the Mistress,’ he said, smiling. ‘What happened to the captain?’ he asked. ‘He survived, Ma’am,’ said the Lieutenant. She looked over the armada around them. ‘How long have you been down here?’ she asked. The Lieutenant gazed over the boats. Niamh recalled a fourteen year old David, red faced and angry, shouting at her that he wished she had never come back, that she loved the boat more than him. A wall of rock emerged from the darkened blue in front of them. If they kept going at this speed they would crash into it. Niamh seized a rope. It was too late. The wall of rock was on them – and then it was not. Instead they were inside a vast cavern, far above them the water whirled and keened through a hole in the rock. But it was not that which caught Niamh’s eye. In the middle of the cave was her boat, “Mistress”. Her heart lifted. Every fibre of the hull, every line of the sail, every knot and turn were known to her hands. As they came closer, she saw a large hole down the side, the paint and smashed. It’s not too bad, she thought, when I first got her she was just a shell. I restored her in scarves and hair braids, I can do it again. The ship pulled to a halt and a ramp was lowered. Niamh and the Lieutenant climbed down and walked towards her boat. The other boats and ships had also drawn up around them and the human denizens of the deep were gathering. They were mostly men, but here and there, Niamh saw children. In their round, open faces she saw David peering out from behind his Grandmother’s skirts, waving as Niamh left for the sea again. But where were the women? Part 2 up 21st Jan!